Blaze Fast-Fire’d Pizza, the recognized world leader in fast artisanal pizza, has already conquered the hearts – and taste buds - of discerning pie lovers everywhere since launching in 2012. Now the brand is expanding into large sharable pizzas and extending its reach beyond the four walls of its restaurants. It’s all part of the brand’s plan to diversify from its well-executed dine-in focus to now also serve the carryout and delivery segments. “We’ve been leaning into this strategy of adding a second leg to our business for the last year and are now really embracing it,” says co-founder Rick Wetzel. “We’ll now be able to compete in all three segments of the $40 billion pizza category: dine-in, delivery, and carryout.” That will also help the brand take on Domino’s and Pizza Hut. Last year, says Wetzel, the brand did about 10 percent of its business in online off-premise sales. In the fourth quarter alone, the brand’s off-premise digital sales grew 121%. The company hopes to double that number to 20 percent of business in 2019 and then continue pumping it up in the coming years. Their new website and revamped smartphone app are designed with delivery and carryout in mind. There’s even a new exclusive deal with delivery experts DoorDash and Postmates, who use their networks of local couriers to deliver the artisan pies. Blaze built its reputation on its signature 11-inch personal pizzas made with fresh dough, and real ingredients and cooked in a blazing hot open-flame oven. The new 14-inch pizzas will help us serve our ‘at home’ guests when they may want our pizza in a shareable format, says Wetzel. Customers can easily log on or tap their app to order Build-Your-Own, Meat Eater, Green Stripe, Veg Out, BBQ CHKN, and Red Vine pizzas. Restaurants in California and Nevada are currently testing the new bigger pizzas. The company says it’s keeping pricing competitive with the legacy pizza players. For example, there are online deals such as a large pepperoni pizza for $8.95 or two large 1-topping pizzas for $20. Online orders placed through the Blaze website or Blaze app can be delivered for just $4.99. Wetzel says the company is planning to announce its rollout plans at its national convention in March. Every one of these moves is strategic, says Wetzel, and meant to help both existing franchisees and new ones. The company’s counting on strong growth in off-premise sales to open up new types of real estate and increase development potential to more than 5,000 locations in the U.S. That means increased sales, growing customer counts, and more profit for franchisees. Blaze Pizza is a proven concept and a solid brand with proven unit economics. Wetzel says it’s an exciting and growing brand that’s relevant, forward-thinking, and overseen by a great management team and the resources to provide outstanding franchisee support. The brand has received numerous accolades and was recently named #1 ‘Brand of the Year’ in the Fast Casual Top 100. 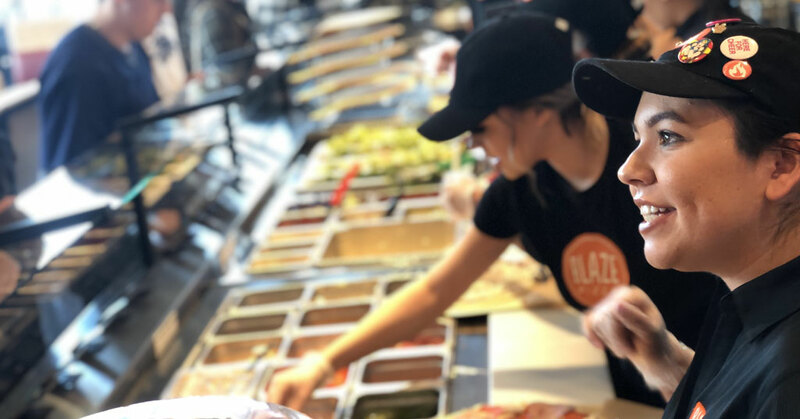 With systemwide sales expected to exceed $400 million in 2019, now is a great time for entrepreneurs and franchisees looking for a new investment opportunity to take notice of Blaze Fast-Fire’d Pizza. The brand is looking to add qualified franchise partners and has markets and territories available for development. Blaze Pizza now has more than 320 locations in 41 states and five countries.